It hasn’t been particularly healthy here on the blog as of late; rather a lot of chocolate and cake and pizza about. I swear that’s not an honest reflection of my family’s dining habits in recent weeks, but it is true that my new year’s resolutions of eating more healthily have slipped somewhat. So when M&S got in touch to see if I’d like to review one of their new healthy eating recipes, it sounded like a rather good idea. 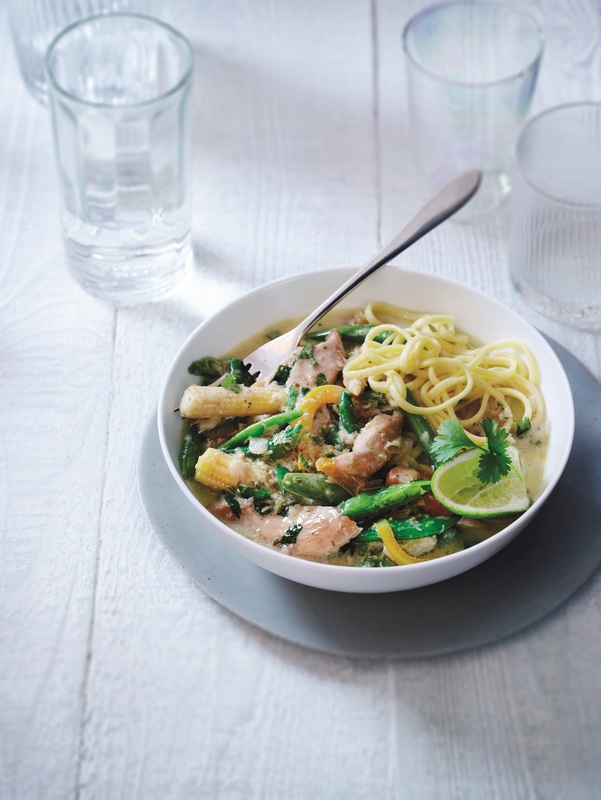 M&S have put together four easy recipe cards for under-400 calorie meals, which means they are particularly suited to anyone on the 5:2 diet. I opted to test drive the Thai green curry recipe, which uses a jar of count on us Thai green curry sauce. Back in the days before I used to cook much, only about nine years ago before the children came along, I wouldn’t have though twice about opening a jar of shop-bought sauce when I was making a curry. But not these days. I find most jars lack any decent flavour and are never nearly hot enough for my taste. And Thai green curry is right up there at the top of my favourite curries list. The best one I’ve had recently was at the Pan Asia restaurant in Bath, where the bling decor is as fresh and zingy as their dishes. So M&S would have to turn out something pretty tasty to impress my husband and me. But do you know what? It was actually pretty good. I was about to continue that sentence with for a sauce from a jar. But no, I stop there. It was pretty good, full stop. OK, so it wasn’t as hot as I’d have probably made it myself if I was starting from scratch, but I do tend to like things hotter than most and the chilli flakes scattered on top took care of that. We were very liberal. It also needed the fresh lime and coriander to create those tingles on the taste buds you’re looking for when you have a green curry. What I probably appreciated most though was how quick it was to make. We had it one evening after the children had gone to bed, and I really wasn’t in a cooking mood, and it took less than 20 minutes. At just 385 calories per portion, it’s definitely a winner in my eyes. I’ve got my eye on their jalfrezi sauce to try out next. Here’s the recipe or download the M&S recipe card as a PDF. lightly coloured. Remove to a plate. Add your choice of vegetables, such as baby corn to the hot pan, stir-fry for 2-3 minutes before adding the more tender sugar snap peas and pepper; stir-frying for a further minute or two. Serve with egg noodles. Garnish with chilli flakes and a wedge of lime. Disclosure: M&S provided me with all the ingredients for this dish in return for trying out their recipe. All views expressed are completely my own and are 100% honest. It’s always so nice to find a ready-made product that you like. It’s always such a drag at the end of a busy day to feel like you’re settling if you turn to a canned sauce, so it’s great when you find one you really like. Not had sauce from a jar for a long long time but M&S would definitely be ones that I would consider if I would need one for a quick easy supper. 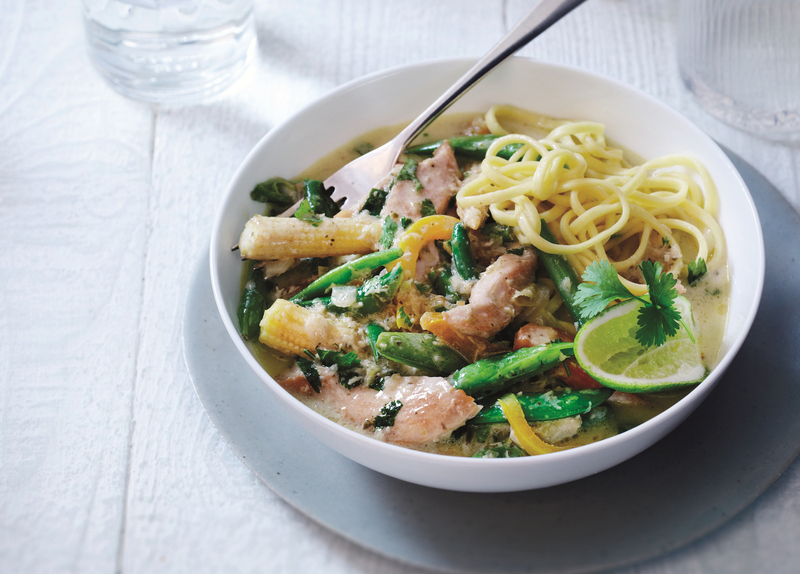 Thai green curry is one of our favourites too and you’re right it has to be hot. I’m very wary of ready made sauces as they usually have tons of salt and other ingredients I’m not too keen on. Looks delicious and so healthy too! I don’t tend to use sauces out of a bottle but if its M&S then I may make an exception. Sometimes, even a food blogger doesn’t feel like cooking and its nice to have something to fall back on. I can get quite snooty about jarred sauces but we recently had a pasta sauce that was really very good. Like you, to save them for evening when you just don’t have the time or energy is brilliant and saves you getting a takeaway to boot! I’ve made the banoffee pie from these cards and it was AMAZING!!! I can’t remember the last time I bought a ready made jarred sauce either BUT I probably should. For the time’s I can’t be bothered to cook anything once the kids are in bed and end up with toast or something on toast out of laziness!.